If you thought culture, historical monuments, and undiscovered nature were the only things Iran had to offer, think again! 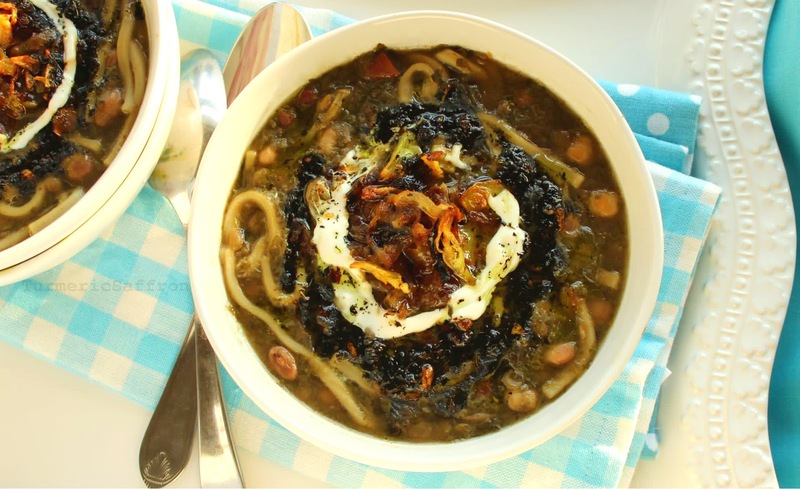 Iranian cuisine has something to tell you! 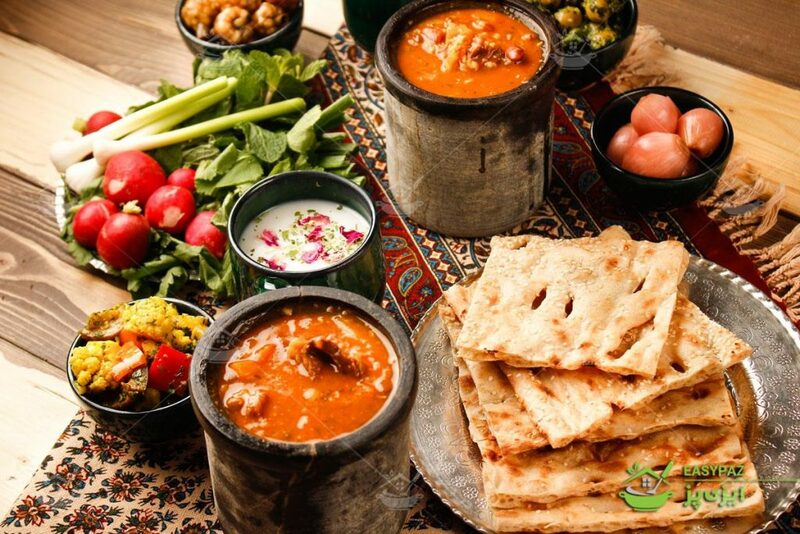 Due to its temperate climate and rich agricultural lands, together with its central position on the Silk Road route, Iranian cuisine has it all. Full of surprises, Persian flavours mix European, Russian, Arabian, Turkish, and even Pakistani flavour together in a taste sensation. Iran may be known for its caviar, saffron, and pistachios; but don’t let these token souvenir foods blind you from what else Iran has to offer! 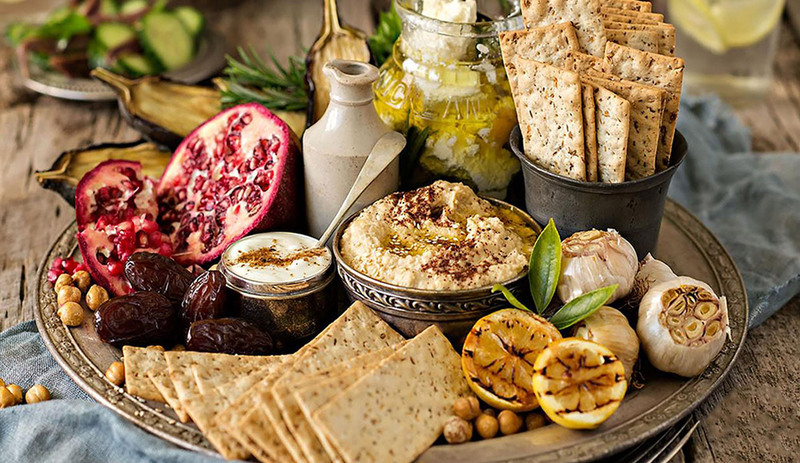 From a variety of pickles, all sorts of smoked fish , spicy samosas, falafel, hot and sour shrimp dishes, local noodles, stews/broths and different types of flatbread, Iranian food is full of wonders! 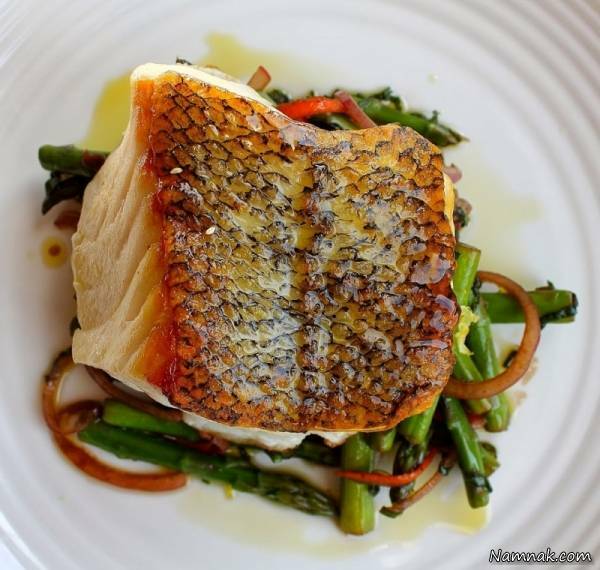 Are your taste buds watering yet? You can apply for your Iran visa with ultimate ease through 1stQuest. Iran is a big country and thanks to that, it offers a variety of dishes and cuisines for all types of tastes. Pistachios, almonds, walnuts, saffron, mint, oranges, pomegranates and grapes. I’m sure you have tasted kebab at least once in either your native country or on holiday, but nothing compares to the Iranian Kebab. 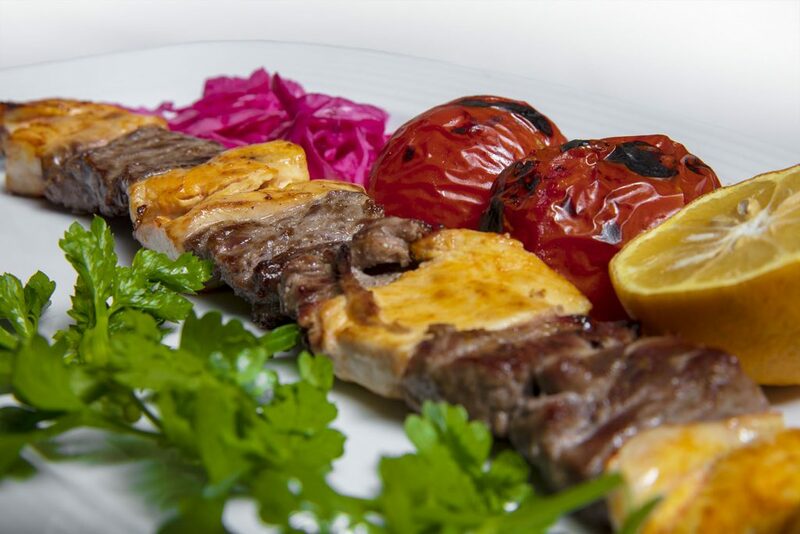 The different types of kebabs are endless in Iran, and you can get even a special type of kebab which is local to each city which you travel to. Visitors love the Iranian Kebabs so much, that some even call their trip Kebab project. These delicious local delicacy is either served with Rice or Bread. Usually decorated with fresh herbs like mint, pickles, especially local olive side or shallot yogurt. Here is a couple of Kebab choices which you can easily find anywhere around Iran. 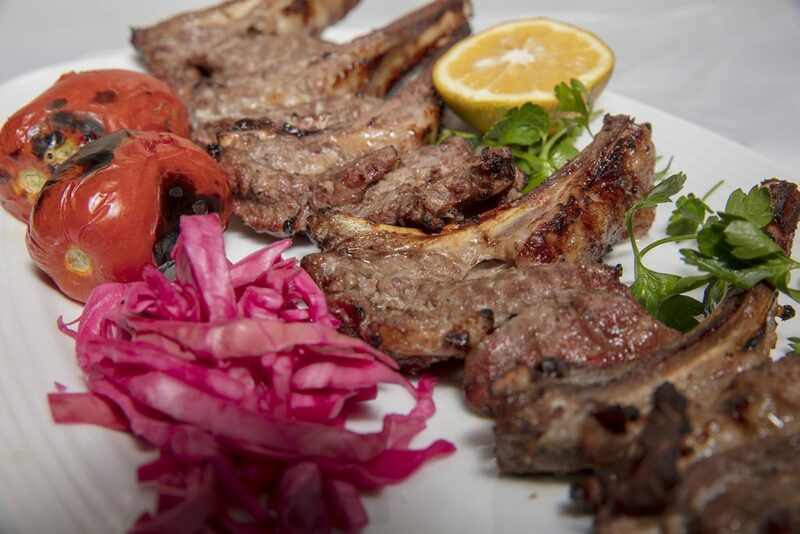 There are also a wide range of local kebabs which are unique for the city you are traveling, so do make sure you ask the waiter if they offer any local dishes along with the main set of kebabs. 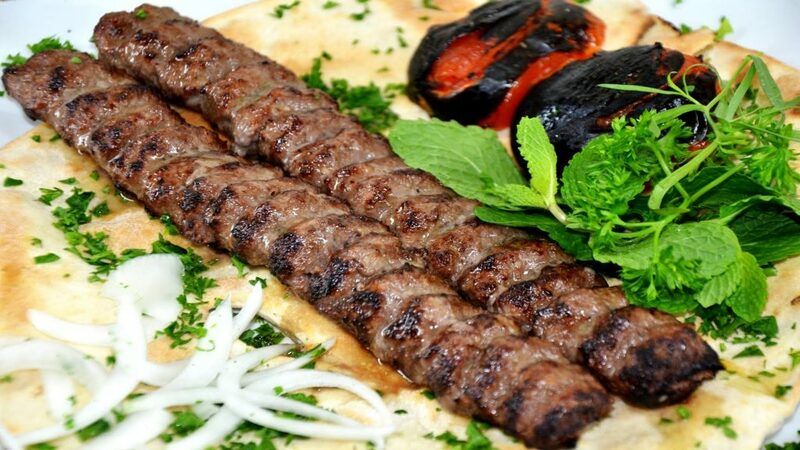 Chelow Kabab the national known name for a Kebab dish, which is steamed, saffroned Iranian rice served with kabab. 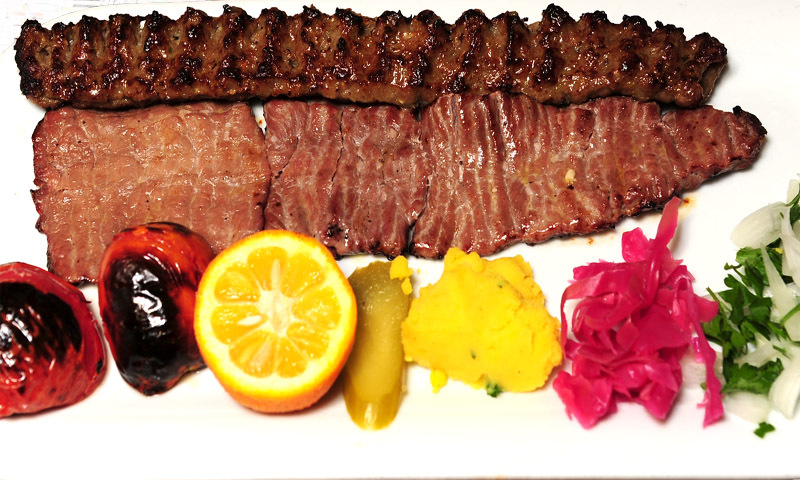 Kabab Koobideh: Iran’s signature Kebab and the all-time favorite! Made from ground lamb, beef or chicken mixed with chopped onions. 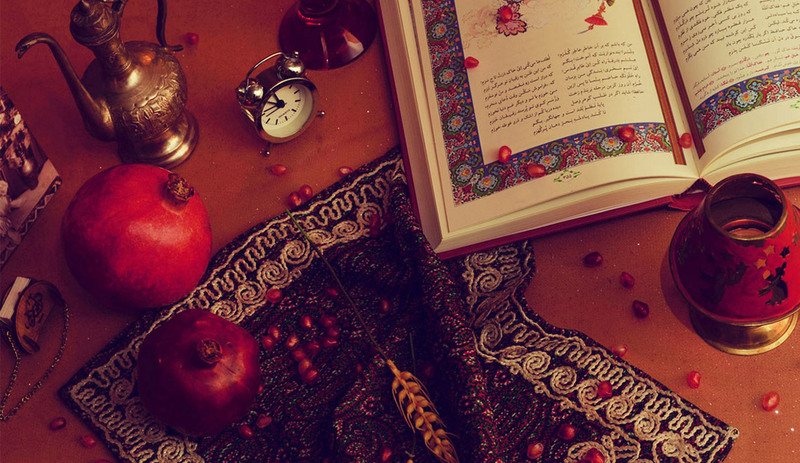 Koobideh refers to the preparation which means it is smashed by wooden mallet. 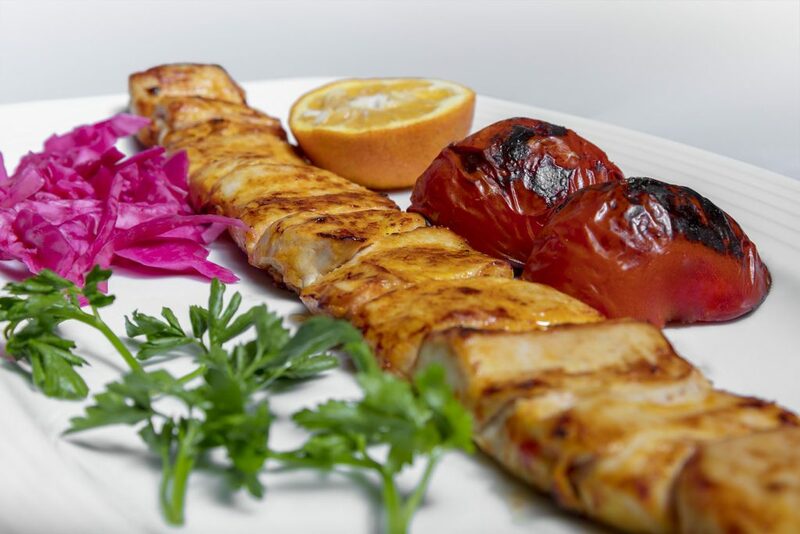 Joojeh Kabab: Joujeh Kabab is barbecued chicken with olive oil, tomatoes, and saffron. 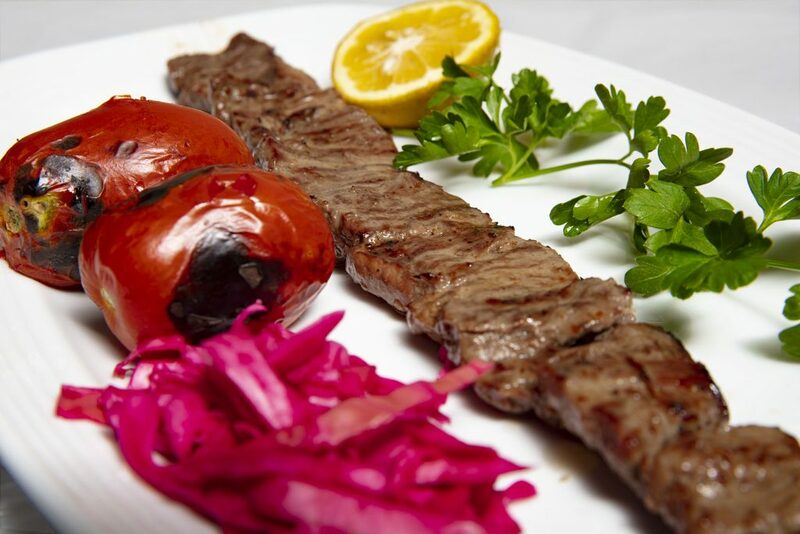 Well, in Iran we have a variety of way in which you can eat Kebab, but here are a couple of things which will go well with your choice of kebab. Iranian cuisine has always something to tell you. Barbecued Tomatoes – the more it’s cooked, the tastier it gets! Barbequed Chilies – even though it is quite new to Tehran, but these sweet chilies are quite common in the southern part of Iran. Fresh Herbs – You can get a selection of fresh Mint, Parsley, Basil, and other fresh herbs along your dish. 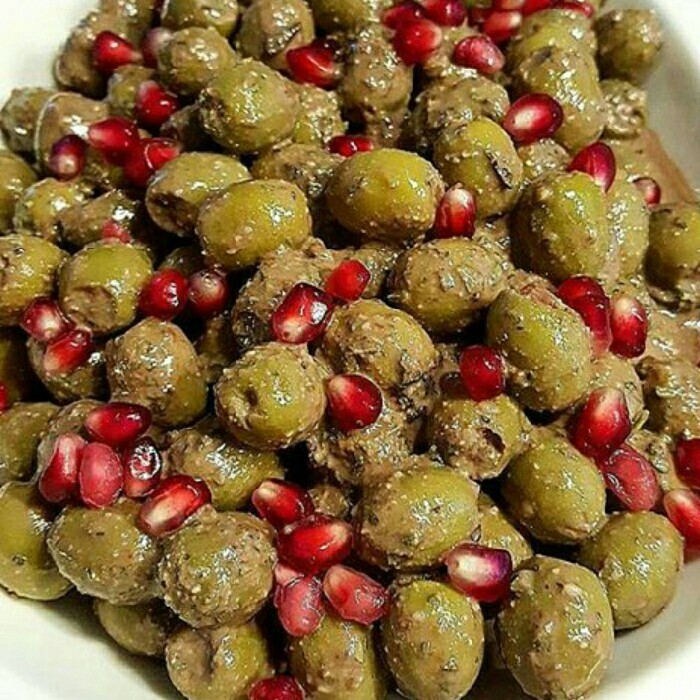 Olives (Zeytoon) or Zeytoon Parvardeh – You can either have a selection of local Iranian Olives (Zeytoon) or try Zeytoon Parvardeh which is a mixture of olives, pomegranate juice, and crushes Walnuts. Pickles (Torshi) – We have a selection of different types of pickles, you can taste the difference as it gets more spicy in the south of the country and saltier around the middle. Iranian cuisine has always something to tell you. You get to see a lot of pickles which are made with garlic or solely just garlic cloves mostly in the northern part of Iran. This goes well with almost all seafood dishes. As must try! Even though we the Iranian Kebabs are too delicious to resist, you shouldn’t forget to try other Iranian dishes which are mainly consumed at home and cooked for the family members. 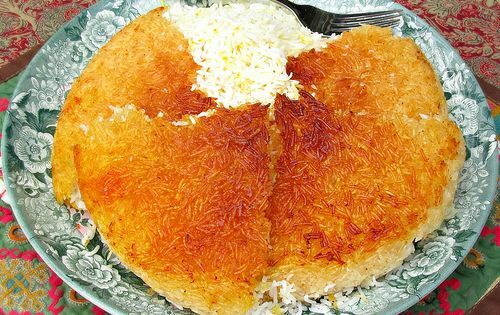 Unlike Kebabs, which is mostly identified as eat out, holiday or barbeque food, the following dishes are more common and consumed inside Iranian households and are rich with unforgettable flavors. Saffron, fresh herbs, dried plums, pomegranates, raisins, prunes and pistachios are generously used and is common in most Persian dishes. 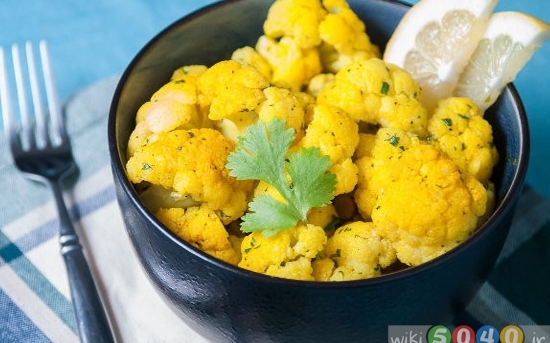 The general flavor is moderate, where it’s not too spicy, too sour, too sweet or too salty. Iranian cuisine has always something to tell you! 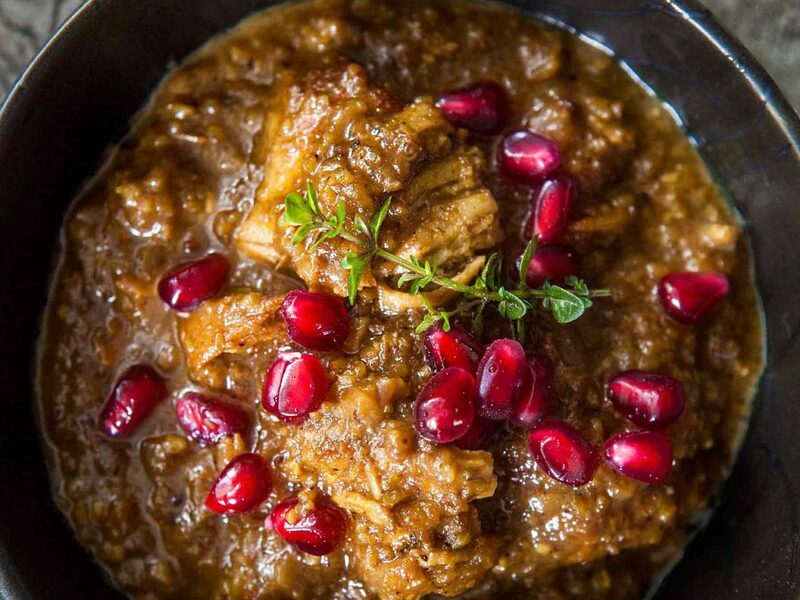 Stew is a very common method to cook Iranian dishes and there are a wide variety with some common dishes around the country. Iranian cuisine has always something to tell you. The secret to a prize characteristic Stew in the Persian cooking is to cook the stew long enough for the oils to rise up. 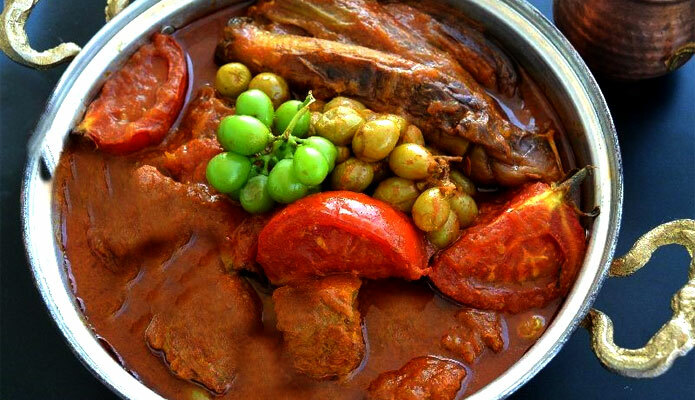 All Persian stews are thick and meant to be eaten over rice with spoon and fork. 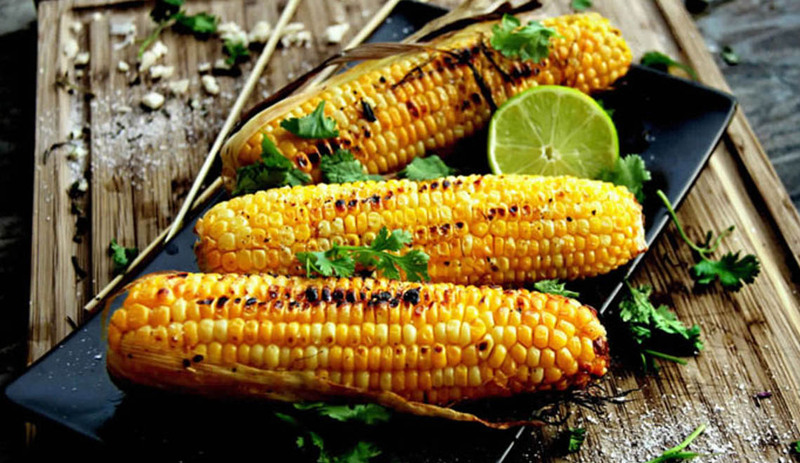 This favorite national Dish dates as far back as 515 B.C. 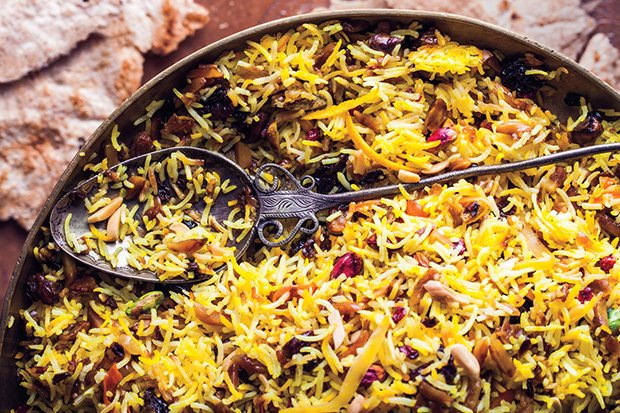 Iranians love sour flavors and this barberry studded classic rice dish is one of the favorites! 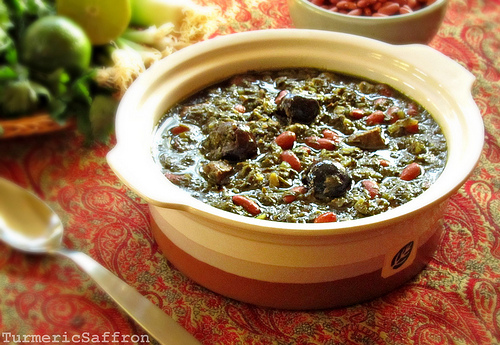 Ghormeh Sabzi (Lamb, Kidney Beans, and Green Herb Stew) This Unique flavored dish may be a bit unfamiliar to most westerners, but surely is a dish to try. This richly textured soup full of noodles is perfect on a cold day to even warm up the soul. The life and soul of Persian cooking. It’s the crisp, golden layer part of fried rice at the bottom of the rice pot. 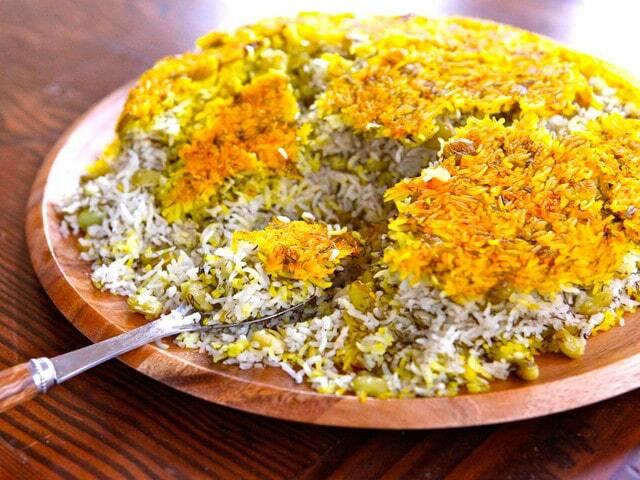 The most sought after part of the dish which brings out the competition amongst family members. 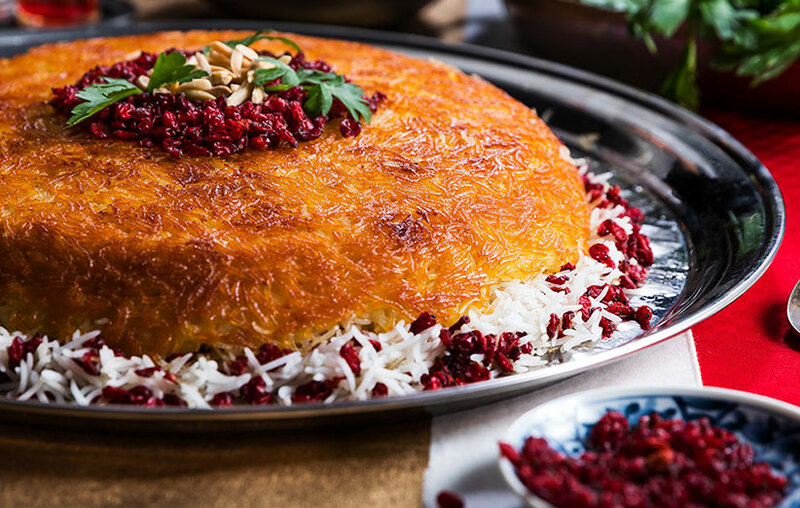 You can eat Tahdig by using your fingers as it is quite crispy and difficult to use a fork or a spoon. Do remember to ask for it if you are in a restaurant as it’s usually not mentioned on the menu. 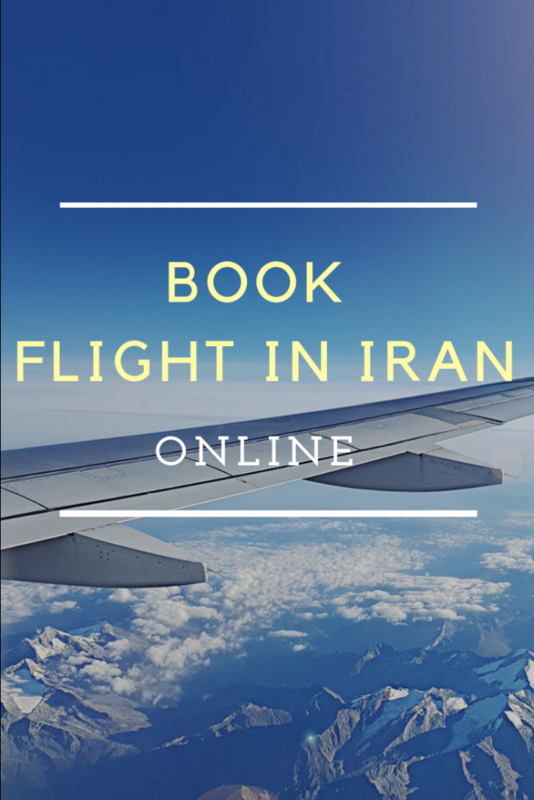 Iran is one of the most popular destinations now! 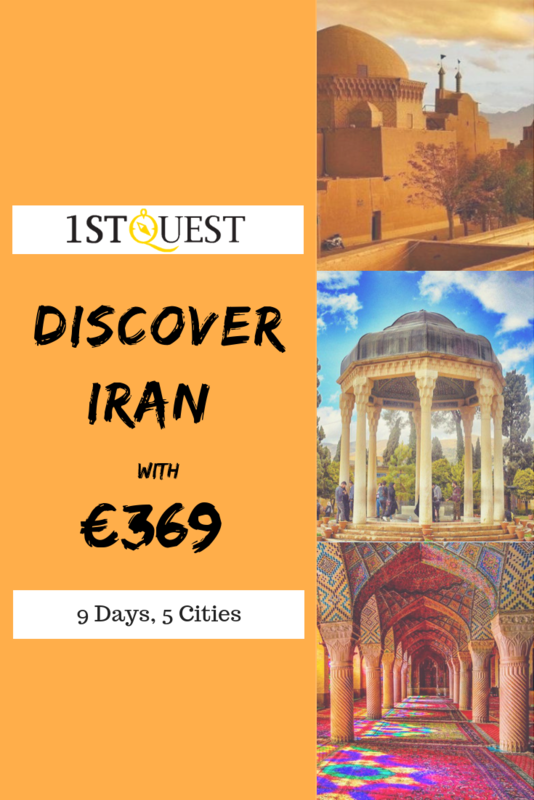 you can get your Iran visa and book Iran hotels easily with 1stQuest.com.